I spent a a day going through a tutorial on creating a sortable photo gallery that scales to screen. This relies on fancybox to provide light box functionality to hi-res images. On resizing the screen, the thumbnails animate to a new grid lay out. Other design elements such as the navigation and background art adjust for computer, tablet or phone. At phone screen size, the light box behavior is disabled and a straight targeting of the hi-res photos occurs. Make the gallery load content dynamically. add light box behavior back to images when screen goes from less than phone screen size up to tablet size or larger. Interactive animation – bouncing balls – created with the Box2dWebb and CreateJS frameworks. This is a canvas application that will play on mobile. The bouncing ball logic is all handled by Box2dWebb – which is a port of a physics engine used in ActionScript. Animation properties (bouncieness, etc) are set up in the init. A bit map (the soccer ball) is loaded into a createJS sprite and loaded on to the stage (canvas). A box2d object is created and added as a property of the createJS objects. On the ticker, the bitmap tracks the x, y position, and rotation of the physics object as it bounces around. Dive into the Box2DWebb code and figure out collision detection. Note – As a Flash developer, I have found the CreateJS frame work to be both helpful and a little frustrating. There are a couple key version discrepancies that I had suss out on my own. Although, I did not use Flash for this little example, the CreateJS Toolkit that is built into Flash CC exports versions of the frame work that are not the latest. Apparently there is an update to Flash Professional that is due out soon and this will be addressed. More canvas game set up experiments forth coming. Stand bye. Back from a two week vacation in the desert. I provided guerrilla art support for a number of projects at The Burning Man festival. What does that mean? About 10 days of driving around loaning out tools, jump starting dead vehicles, getting broken equipment fixed, getting crew members moved off of their work site and into their new camp sites just prior to opening night, bringing volunteers out to projects much in need of bodies – in short – getting-it-done. I had a lot of fun riding in and saving the day. This is my first year in a long time of not being on an art project and of having my own 4 wheel vehicle. I bought this chopped Dodge RAM cargo van on craigslist a week before coming out and it became my rolling office. If you saw a blue truck rolling around out there doing the same thing, that was my buddy Stephen from the Temple Crew doing the same thing. We didn’t plan that. Being a couple event OGs saw a need and we jumped in. 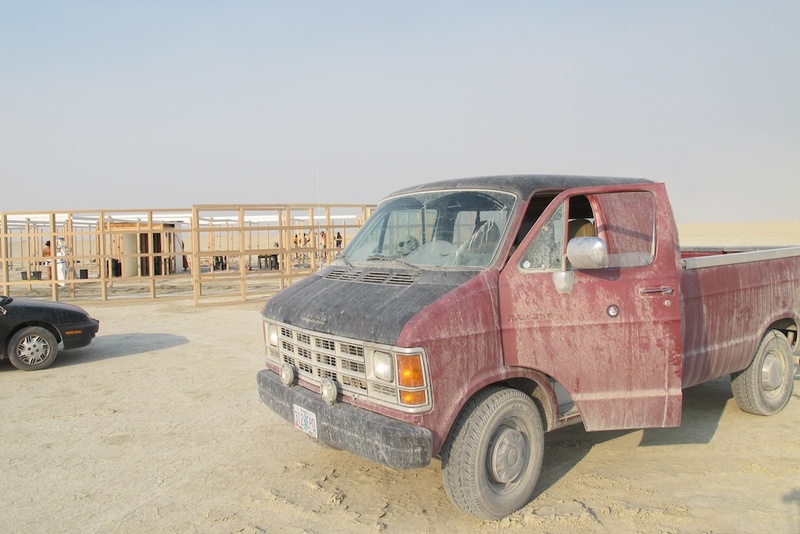 Artist at Burning Man are on their own in terms of gear, food, supplies, camp infrastructure, etc. There are too many projects for it to be otherwise. However, as the event evolves, more and more artist from around the world who have no experience with this wasteland called the Black Rock desert – one of the most inhospitable places on the planet – are coming out and trying to make a go at. Which provides those of us who have more experience out there, and have the personal connections, to do what we can to keep things moving…. to Get It Done. I would encourage every participant at Burning Man to look around. Find an art project that is not done. Schlep a bag of ice out to he crew… or some viddles. One crew I spent a lot of time with was eating granola and drinking hot Gatorade for serval days. If someone had shown up with 6 cheeseburgers and cups of coffee on Tuesday night, they might have mustered the strength to finish up sooner. Sometimes a crew just needs bodies to throw stuff on a truck. Jump in! It’s a great way to meet new friends.